Discussion in 'VV/VW APV Discussion' started by Baums, Mar 25, 2013. Was considering stepping to a VV or VW device. Was just looking at the ego twists but thought if I'm spending that much, should I just get something better. Not sure I want to step to the price of a provari, but wanted your opinions on the best bang for the buck. So PLEASE, suggest away. If you know the price let me know. Thanks all. I know I can always count on this awesome community. Around the 50$ price range. Although a Provari would pay for itself long term. Personally, I have a real preference for the Vapor4Life Dial-A-Volt products. 1300mah XL's. The KR808D-1 connection isn't nearly as popular as the 510, but the hardware I get from V4L is quality stuff. Reasonable prices. Very elegant in use and style, with a full one-year warranty. Customer Service and forum support is superb! Whether that makes me a "fanboy" or not is up to everyone else. I've had some exposure to vision spinners and joyetech twists (which are similar), and I don't need anything special to fill the tank, plinth rings to hide the posts, and my charger is a simple one piece design with over-charging protection. The VAMO was my first VW device and i love it. For around $50 it's a really great device. Sure, a Provari would be better, but personally i don't see a need. If you get the VAMO and hate it you're out $50. Cool thanks for the suggestions. I'll take a look. A BAM blemish is a great deal, can be done for under $140 with a Kick. The Billet Box if you want to wait, a ProVari Blem will save you 20 bucks on a ProVari. I ordered a Vamo for under $45 (including shipping) yesterday from Exhale vapors and they sent the order same day. Its coming from Texas I believe. Should be here in a day or two. This is my first VV/VW PV, good price and great reviews, all for the price of a carton of cigs. I want a Provari mini but im hoping they come out with a VW model before I buy. The Vamo is working out great though. Im trying to spend less on vaping than I would on smoking, and its easy to get carried away. Could you explain this a bit further if you would. I am learning here and am intrigued by this. OK did some research on the Vamo. Quick question for those of you that suggested it. Does the 18650 battery really shake and rattle THAT MUCH?? So noisy and cheap sounding. Oh awesome! OK so then that begs me to ask, how do you know what wattage to use? 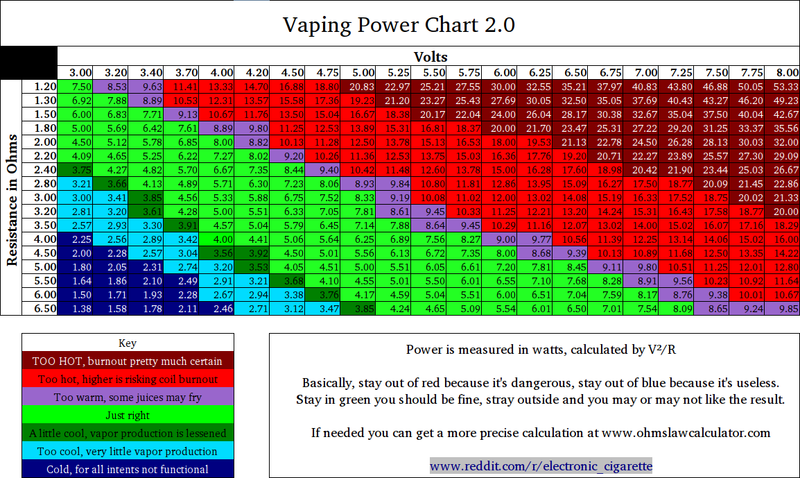 I have seen the volt to ohm chart but never a wattage one. I can't say if the 18650's rattle on the Vamo V2. I do not have any rattle with one or 2 18350's. I get about 2 days out of the 18350's running stacked. So far I am happy with the Vamo SS. Might get an iTaste SVD down the road.